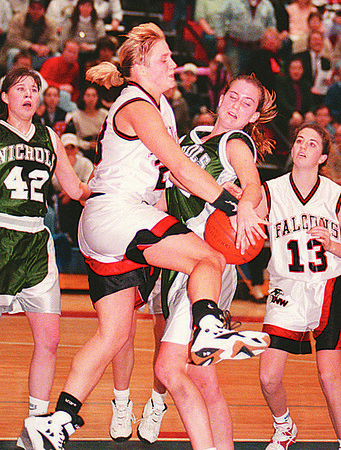 2/12/97--NFL GIRLS HOOPS 2--DAN CAPPELLAZZO PHOTO--N.W. ANGLEA TYLEC BATTLES NICHOLS KRISTIE GREENE WITH SECONDS LEFT IN THE GAME. A FOUL ON THIS PLAY AWARDED TYLEC TWO FREE THROWS TO WIN THE GAME FOR NW 45-44. NICHOLS KARRA CROSS AND N.W. 'S JENNIFER GRAWE LOOK ON.